PRODUCT: VERSI-FOAM AP FAN-SPRAY NOZZLE KIT. PRICE/KIT. 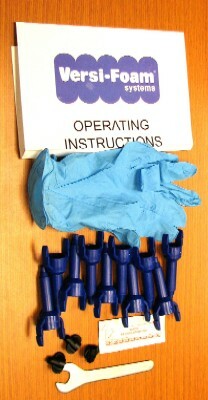 DESCRIPTION: Complete nozzle kit for Versi-Foam Systems. Nozzle fits RHH Versa-Foam System 9, 10, 15, 28, 33, 50. Does not work with System-31, System-100, System-1 or Class-1 fire rated or slow rise foam systems. The nozzle kit comes spray fan tips, nozzles, petroleum jelly and a valve adjustment wrench.